A Clear Lutheran Voice from Germany | The Old Adam Lives! Comment: Therefore in its use of scripture the church is neither lost in historical relativism nor subject to the tyranny of particular agendas. Comment: Therefore no particular structure may be required, neither the papacy, nor the historic episcopate, nor congregationalism. Comment: The church may not fall into the trap of claiming to be the “public church,” a term that conveys the idea that politics are an appendage to the church’s mission. Comment: As Friedrich points out, this is what has happened in Europe and the Third World where churches have grown together using the Leuenberg Agreement. 1Emphasis added. The full text of Dr. Friedrich’s address, which was given after he was elected Presiding Bishop of the VELKD at its October 15-19, 2005, Assembly, is available on our website under “Lutheran Identity” which is under “Resources.” The VELKD has 10,650,000 members. 2 See “Our Charter” which sets forth the same basic Lutheranism as expressed by Presiding Bishop Friedrich. Thanks to CrossAlone Lutheran District. 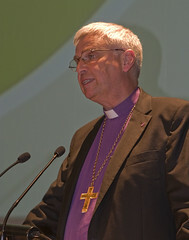 Thanks to flickr and The Lutheran World Federation, for the photo. This is indeed a fine statement that should give hope to all Lutherans about the Lutheran Church in Germany. I note with gratitude , the prominent place the statement gives to the preaching of Law and Gospel stated in the form of the Two Kingdoms. Thank you for posting this St Stephen. Sounds good from here!